One of the main reasons I wrote a book was that there were so many times that I would hear statements by so-called experts about public schools that didn't square with my own experience. Those experts would often claim that their statements were based on some sort of "study" or "research." One of the best examples of this actually came in a book I read after I wrote my own--Jay P. Greene's Education Myths. Greene basically claimed that class size doesn't matter. Well, it does. Joanne Jacobs ran a post yesterday called "Is TSL the Answer?" which is also based on research, but this is research a teacher could learn to love. This research was done by Bill Ouchi, and it indicates that class size is very important. That squares with the experience of almost any teacher who has spent any amount of time in a classroom. Oh yes, there are exceptions. One of the worst classes I've ever had was one of the smallest classes I've ever had. It had five or six really disruptive kids, and the motivation of the class as a whole was very low. I'd get a headache just thinking about the class. On the other side of the coin, one of the best classes I ever had was one of the largest classes I ever had--up until the last couple of years, that is. That was a regular American History class with 27 kids, but there was an unusually high number of motivated students in it. That class was an absolute delight. But most classes have more of a mixture of kids--a couple who are pretty motivated, one or two who are mildly disruptive, and a lot who fall somewhere in the middle. In those classes, size definitely matters. Up until just a few years ago, I was very fortunate. My classes were usually around twenty-two or twenty-three kids. Our school district has had to make cuts, however, so things have changed. This year each of my three regular American History classes have thirty-two kids in them. If anyone thinks its not harder for me to do the kind of job that I want to do, they are out of their minds. My classroom is so crowded with desks that just walking up and down the rows is a challenge. I tend to evaluate just about everything, and correcting papers seems to take forever. In social studies and English, there is nothing like having the students write to bring about and measure learning, but the more kids I have, the less attractive making writing assignments becomes. It also becomes increasingly difficult to try to give the attention to low achievers that might be able to motivate them to do better. Class sizes have increased throughout our school district during the last several years, and there has been a very noticeable deterioration in the behavior, motivation, and performance of our high school students. Gee, is it possible there's a connection? Joanne Jacobs has a post today that deals with some of the nonsense that public schools have to deal with in this day and age. An eleven-year-old brat, with obvious encouragement from his father, wore a home-made t-shirt to school that said, "Obama is a terrorist's best friend." The school had asked their students to wear red, white, and blue to show their patriotism. The school told the kid that he could either turn the shirt inside-out or be suspended. The kid chose to be suspended. Now, Dear Ol' Dad, who's position is that public schools are "full of liberal loons," is suing the school. What a complete jerk! Joanne Jacobs has the best education blog that I know of, and she usually shows good common sense, so I was disappointed when she said, "Having asked students to express a message with their clothing, the school can’t censor the message." The school asked kids to show patriotism. Earlier this year I wrote a post about teaching patriotism, and anyone who read that should know that I would have reservations about having a red, white and blue day--at least at the high school level. But that doesn't mean I think that school should have to put up with a t-shirt containing an obnoxious message like the one that kid wore. If the student wanted to wear a "McCain For President," t-shirt, I think that would be fine. But wearing one that says "Obama is a terrorist's best friend" is clearly meant to cause confrontation. Maybe the eleven-year-old wouldn't realize that, but his father sure would. In fact, does anyone doubt that all the press coverage this incident has gotten isn't exactly what the old man hoped for? The school correctly decided that the t-shirt the student was wearing was inappropriate, and they acted accordingly. Now they are being sued by this pathetic, publicity-seeking father, who is itching for a fight. He has used his eleven-year-old son to get what he wants. As we said in the limbo contest at our homecoming pep rally last week, "How low can you go?" Joanne Jacobs has a post today on colleges having to place students into remedial classes.
. . . a new study calculates, one-third of American college students have to enroll in remedial classes. The bill to colleges and taxpayers for trying to bring them up to speed on material they were supposed to learn in high school comes to between $2.3 billion and $2.9 billion annually. 1. Don't let those students in. 2. Let them take the regular classes, and if they don't make it, fail them. Now, I know colleges aren't going to do that, but it would go a long way toward solving the problem. They would also be doing high school teachers across the nation a huge favor. As long as students don't have to learn very much in high school in order to get into college, there are going to be a lot of high school students who don't learn very much. Americans, including American students, are very practical people. They generally have an idea what it is they have to do to get what is important to them, and they have an amazing capacity to get that done. On the other hand, especially when it comes to high school classes, if you can't make it clear how the learning in a class will matter to them in the very near future, many of them will make very little effort to learn. Any high school teacher can think of kids who seemed useless as students in high school, but then found something that they really wanted to do in life and ended up graduating from college in order to do it. Kids who seemed like they could never be good students became good students as soon as becoming a good student really mattered to them. High school was too easy, Jeronimo says. She wishes she’d been told to work harder. She wishes she'd BEEN TOLD to work harder? Puh-lease! I have complained before about the media's coverage of public schools, and there is one thing for sure--it ain't just Fox News. This week CNN is running a feature called "Broken Schools." Man, am I tired of this garbage! I've watched two of the segments, so far. The first one I saw was about "Dropout High" in Los Angeles, a school with a 58 percent dropout rate. It was pretty clear in that one that the school was in a neighborhood that was an absolute mess, and the school was stuck with dealing with its problems. The second one was about paying students for their performance in school and paying parents for getting involved. Neither of the two reports I saw really blasted public schools themselves, but I've got to wonder what they've got is store for the rest of the series. Let's face it, the title of the series says it all; it isn't exactly something that would inspire confidence in American education. It is clear that bad news sells, and that is why the networks do what they can to dig up any dirt they can find on anyone or anything in the public eye. A few weeks ago, bloggers like KDerosa were gloating about a study saying that the public thinks more highly of the post office than public schools. Why am I not surprised? I mean, how many times do you see featured series on news networks titled, "The Broken Post Office." Considering the bashing that we consistently take from the national media, it should surprise no one that there is a lack of public confidence in public schools in general. Yet, as Michael Mazenko pointed out in his article "The Mis-education of Sean Hannity," "Gallup polls show seventy-five percent of Americans are 'satisfied' or 'very satisfied' with their children's school. An even greater percentage of Americans (85%) are satisfied with their own education." One has to wonder how much higher than 75 and 85percent those numbers would be if people weren't constantly being told by the media that public schools are lousy. The blasting public education is taking is nothing new. Much of my next couple of paragraphs is a repeat of a post that I did a couple of years ago, but I think it bares repeating. Two years ago, CBS had a story titled All Children Left Behind in which the featured another "blue ribbon" report saying that American education was falling hopelessly behind other countries. I remember reading Michael Crichton’s Rising Sun in the early 1990s. When the book came out, the U.S. was mired in a recession and Japan’s economy was rolling along. They seemed to be able to do no wrong. Rising Sun led the reader to believe that Japan was on the verge of taking over the United States economically, and of course, one of the main culprits was our education system. Perhaps the most famous lambasting of American public education came in 1983 when the National Commission on Excellence in Education published Nation at Risk. We were told that "if an unfriendly foreign power had imposed our schools upon us we would have regarded it as an act of war." Many people remember that, but if you think that was the beginning of reports decrying the horrible state of American education, you’d be wrong. 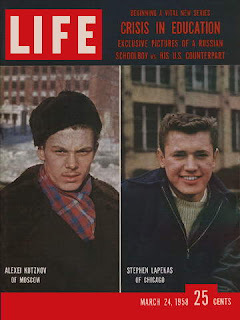 Before that, a Life Magazine cover that breathlessly announced a series of articles on the crisis in American education. The date on that magazine: March 24, 1958. So for at least the last fifty years we have been hearing pronouncements that our education system—especially public education—has been doing a horrible job, and these pronouncements have inevitably been accompanied by doom and gloom prophecies about what this would mean for our nation’s future. If we were to take seriously what the media has been telling us about the American education system for the last fifty years, we should have been shocked when America landed the first man on the moon, then shocked again when it became clear that we had won the Cold War. Then we should have been absolutely flabbergasted when our economy recovered and became the envy of the world for the last two-thirds of the 90s, while Japan’s went into the tank. My question is this: If our public education system has been so terrible—or failing, as so many like to say—how in the world has our nation continued to do so well? Let me make one thing clear. I know there are problems in public education. There is no question about that. There are problems in my own school. I don't think we're as good a school as we were five years ago. Yet, there is no doubt in my mind that any student who comes to our school and wants to get a good education can get one. Our big problem is that not enough want badly enough to do that. As I began typing this, Fox News was running a story defending John McCain's statement that despite the financial crisis our nation is experiencing, our economy is fundamentally sound. The major point of the story was that the main fundamental in our economy is the people who make up our workforce, and our workforce is the most productive in the world. By workforce, I assume they didn't just mean factory workers, but also managers, computer programmers, engineers, researchers, etc. Gee, I wonder where most of those people went to school? I finally broke down and ordered Sweating the Small Stuff by David Whitman. In the book, Whitman describes six high-performing inner-city schools, and he tells us that they are so good because they are "highly paternalistic." All of the schools take a no-nonsense approach to discipline and work hard to create a positive school culture in which bad behavior is unacceptable and good behavior is rewarded. All of the schools go to great lengths to explicitly teach various social behaviors that one would expect to be second nature to middle and upper-income youth. All of the schools put great emphasis on attendance and manage to lengthen the school year and/or day in some fashion. And all of the schools have produced results that are quite impressive. I think all of those are good things, and I don't mean to negate any of them. But as I read on, I came upon this information about the schools that gave me my "A-ha!" moment. Whitman acknowledges some limitations to the these results -- the KIPP in the Bronx enrolls students that outperform their community peers before entering, The SEED School expels about 5% of their students, and Cristo Rey only admits students that they believe are capable of working in an upscale office, for example. From the little I know about them, I'd say that these schools deserve the praise they are getting, but those are important limitations. In fact, those limitations make all the other things the schools are doing possible. If there are lessons here that someone wants public schools to learn from, we are going to need to have some power that at least resembles the power that the schools presented have. If the public really wants us to have a "no-nonsense approach to discipline" and "to create a positive school culture in which bad behavior is unacceptable," then we are going to have to be able to impose meaningful consequences for that bad behavior. My understanding is that KIPP schools use humiliation and some kids end up dropping out as a result. I don't want us to use that. Cristo Rey only admits the students that it wants, and public schools certainly can't do that. The SEED School expels about 5% of their kids. Most public schools shouldn't need to expel than many, but maybe some do. My point is that there has to be a bottom line. When someone says that they won't accept bad behavior there have to be very serious consequences for anyone who is determined to behave badly. We don't need kids in public education to behave flawlessly, but we do need them to behave reasonably. At least in the case of KIPP schools, I suspect that many parents who send their kids to them are hoping that they will become academic all-stars. I'm not knocking that, but that's not what most American parents are interested in. Most Americans just want their kids to get a good solid education. I'm absolutely convinced that public schools can provide that if we're given just some of the powers that those "paternalistic" schools have. "The government has ruined the education system." Sean Hannity made this claim during a series of rants the other day as he argued down another liberal who was foolish enough to call in and debate him. Ruined? The system may be troubled, inconsistent, inefficient, faltering, even damaged - but ruined? I have to disagree, and it's not just because I'm a teacher. As for the government being responsible, I was surprised by Sean's focus, as he usually blames the teachers and the unions. The word "ruined" implies that at one time it was in good, even excellent, condition, but it no longer has any redeeming qualities. Both aspects of that assertion are flawed. In regards to past success, remember that Rudolph Flesch wrote "Why Johnny Can't Read" in 1955. Additionally, Harvard researcher Dianne Ravitch has documented the perpetual ups and downs of public education in "Left Back: a Century of Failed Public School Reform." Certainly, many schools in America have problems, and far too many inadequately educate their students. But ruined? No redeeming qualities? To quote Bill O'Reilly, "that's ridiculous." There are countless examples of excellent public schools that are accomplishing more today with their students than I ever could have fathomed as a student twenty years ago - about the same time as the publication of that dire education warning "A Nation at Risk." I know this because I teach at one. Cherry Creek High School in Greenwood Village, Colorado, is regularly ranked as one the top high schools in the nation. Cherry Creek has an incredibly successful student population. Its large percentage of students in Advanced Placement classes, for which many departments have pass rates on the national exam of 90% or more, regularly accomplish tasks I didn't see until graduate school. Sean might want to take a look at the AP Calculus or European History exams before he decides that the system is in a state of "ruin." Another example - a couple years ago two students at Cherry Creek were featured on ABC News for their work on a new treatment for muscular dystrophy. Their education is hardly in a state of "ruin." I have to admit that part of the reason that I was so eager to check out Michael's article was that I can't stand Sean Hannity. When his face appears on the tube, I almost trip over myself in my hurry to get to the remote so I can switch channels. I wasn't at all surprised to see what he had said about public education, but one of the reasons I can't stand him is because I honestly believe that people like him are the ones who are putting our "nation at risk." When I say "people like him," I'm not just talking about conservative blowhards--I'm talking about their liberal counterparts as well. Our country is becoming more and more split along partisan lines, and as a result, it is becoming increasingly difficult to govern. In order for our system to work, people with different views need to find common ground and work together. Compromise is a necessity. Right now we have issues that absolutely must be addressed, and they must be addressed now. We have to do something about social security. We have to do something about Medicare. We have to do something about immigration. We have to do something about our dependence on foreign oil. But talk-show ideologues like Hannity have turned the saying "Come, let us reason together," into "Come, let us scream at each other," and unfortunately they have done nothing but grow in popularity. I'm sure the dollars are rolling in for Sean Hannity because of what he does. But will either McCain or Obama be able to govern when one of them becomes president a few months from now? Quite frankly, in large part thanks to the growing list of blowhards like Hannity, I think the odds are against both of them. Children are forced into hearing the pro-teen-sexuality, pro-homosexuality, anti-Christian, anti-America messages espoused by the unions. I have heard that type of statement before, and in this post I want to address the part about homosexuality. As a teacher, I find this a particularly tough issue to deal with. First of all, I should make clear that I am convinced that for the great majority of people, being straight or gay is not simply a matter of choice. By an early age, people have a strong predisposition to be one or the other. Whether that happens at birth, or in the early years of one's life, I don't know. But I believe that whether a person is straight or gay is pretty well determined by the time that person is in elementary school. During my 34 years in the classroom, I have had some kids who struck me as probably being gay. I remember one very nice young man who seemed very feminine in the way he spoke and in his actions. He was a fantastic musician, and as far as I know, he never did anything to bother anybody. Yet, I remember hearing other kids in his class saying things like, "We ought to kill all queers!" Years later, I learned that this young man had "come out" while he was in college. But why should he have had to put up with those cruel comments while he was in high school. Things like this have caused me to have sympathy for people who have homosexual tendencies. As I've said before, I consider my religious faith central to who I am. I am aware of the biblical arguments against homosexuality, and I take them seriously. But I am not a fundamentalist--I do believe that the writings in the Bible are products of their times. The most important teachings I get from the Bible are concern for the poor and downtrodden (and to me, homosexuals definitely fit in with the downtrodden), and the idea that we should treat people the way we would desire to be treated ourselves. I am not gay. When I was young, I saw the beautiful young lady who would eventually become my wife, and I was able to woo her without any feelings of guilt. I remember the wonderful and exciting feelings in that process. Let's face it; there are few things as powerful as sexual feelings when you are in your twenties. Who am I to tell someone who has different sexual feelings than I do that they should not be able to go through that same wonderful process that I did in seeking someone that they love? Look at the results of our our society's oppression of the feelings that homosexuals have. I am painfully familiar with two situations in which great damage has been done. In both of these situations, men denied their homosexual tendencies, and got married to women. In both cases the homosexual tendencies eventually took hold. In one case, the man began an affair with another man, and in the other case, the man--who was at that point a father of three children--was caught in a restroom in a bar with another man and arrested. What if we were more open and we allowed people who were homosexual to act on their feelings? Could anything possibly be worse than the two situations I just described? Many people say that gays threaten the sanctity of marriage. As one of my former students said in a letter to the editor of our local newspaper after a pastor in town had told his parishioners that a good Christian couldn't vote for a Democrat because they supported gay rights, how can we make that case when nearly fifty percent of marriages in America end up in divorce? I, personally, believe that civil unions is a reasonable solution to this problem. As you have probably gathered, I have empathy for gays, but I am also very sympathetic to the idea that marriage is something that should be between a man and a woman. If homosexuals want to love each other, live with each other, and be able to visit each other in hospitals, why should the rest of us care? How do I handle this very controversial issue as a teacher? Believe it or not, I keep my big mouth shut. I allow kids to express their own opinions, and I try to remain as neutral as possible. (And I end up with about a 50-50 split.) When kids use the term "gay" to describe something, or if someone says, "We ought to kill all queers," I jump all over them, but if they want to attack gay rights in the opinion papers that they write, it's fine with me. Their chances of getting an A is every bit as good as those who favor gay rights, as long as they support their positions. So there you go. That's this public school teacher's position on gay rights. If this one doesn't generate any comments, I'd better quit blogging! Yes, there is such a thing as a stupid question! There was an article in the Minneapolis StarTribune last weekend on No Child Left Behind. I've indicated before that I have mixed feelings about NCLB, but there was a quote at the end of this article that I've heard before from NCLB supporters, and it never fails to get my goat. It comes from Deputy Commissioner of Education in Minnesota, Chas Anderson, and it refers to the unreachable and ridiculous goal of having ALL kids proficient in everything by 2014. "When people say that we can't hit 100 percent," she said, "I'll ask them, 'If it's not 100 percent, if it's 90 or 80 percent, then you need to tell us which 20 percent of kids we're going to leave behind.' And no one can answer that question." I can answer that. The answer is, "We don't know!" We are talking about a statistic, and we are talking about dealing with human beings with wills of their own. No matter how good a job teachers and schools do, some students, for whatever reasons, aren't going to care about being proficient. We KNOW that there will be some students somewhere who, no matter how hard we try, we aren't going to be able to reach. Will it be Billy Thompson or Sally Wilson? I have no idea! I am often amazed by the things that are done in modern medicine. They have made great progress in so many things. For example, the survival rate for breast cancer has continually increased. But I doubt very much that they are going to have a 100% survival rate by 2014. To set that as a goal, and to tell the medical profession they are failing if they don't reach that would be the height of stupidity. But if you ask, "Well, which women do you want to die?" no one is going to say, Betty Jones and Sally Garfield. We don't know which women will die, and we don't want any of them to, but we know that some probably will. For St. Paul Superintendent Meria Carstarphen, the law's implementation is imperfect. "But without it," she said, "we would have no leverage to bring to light the problems associated with the achievement gap, and that's at the heart of what the spirit of the law is about: Transparency. Are we doing the job or not?" I think showing exactly where schools are is a good thing. I also think it's a good thing to set improvement goals, as long as those goals are reasonable. But when people make statements like the one Deputy Commissioner Anderson made, it's obvious that they are much more interested in playing politics with schools than they are in improving them.